The environmental issue is getting more and more important in the work of a farmer who has to be very attentive to the risks run when using certain products for the preservation and maintenance of crops. After the second World War, in most of the industrialized countries the chemical industry released products which had a great impact on the environment and were also very dangerous to man’s health. A clear example of all this is DDT which, in the 60s, was largely used in crops and also at home as insect-spray. From this point of view Montalcino countryside has been quite lucky because a large number of farmers, in the 60s and 70s, abandoned the country to go and live in towns. That’s why the worst chemicals were not used as parasiticides, herbicidals and insecticides, so allowing the soil to remain clean and uncontaminated. In the 80s thanks to a more widespread and careful information farmers started to be more attentive to what they used to preserve the soil even because they themselves might have suffered the consequences. In our vineyards, for the growing of the vines, we only use products like copper and sulphur which prevent our vines from being attacked by diseases like: downy and powdery mildew. Such natural products form a thin protective film that stops the vine from being attacked by pathogenic germs, lasts for two weeks and can easily be washed off leaving non traces. As we stop treating the vines in July and the grape harvest will be end of September/beginning of October there won’t be any traces left on the grapes. The treatment has a preventive function so only the minimum quantity of the active elements is used. To stop other calamities like the red and yellow spiders we put antagonistic insects in the vineyards, the wind is of great help, too, as it defends the vineyards from botrytis and acid rot. As to the weeds we don’t use any sort weedkiller, we simply use proper tools that completely remove brushwood. The soil is naturally manured. 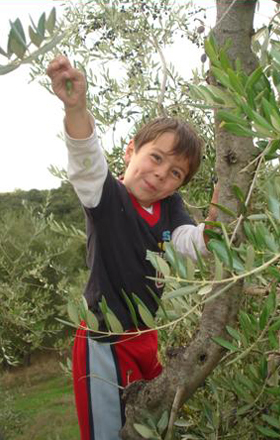 Olive trees have never been treated as there has never been any need. We must also say that crops are properly run thanks to the rooted farming culture of Fabiano and the academic culture of Valentina, she is a biologist and we can proudly admit to be the only ones with such a cultural background in Montalcino area.